My La Fonera arrived. Very cool, if you're not familiar with FON, check it out. It's a community wireless project funded by Google, Skype and Sequoia (whoah). It only cost me $8, but I got in early...it's still cheap at $30. Firefox 2.0 did a session restore and recovered all the tabs I had up on the screen from the hours of research that I had done the night before when I last closed my Mac. 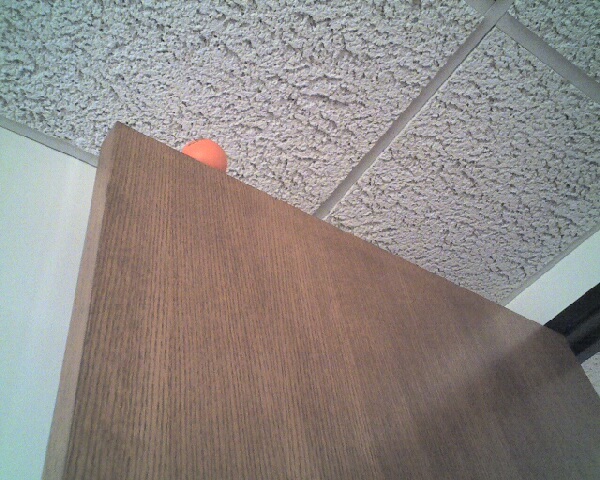 John threw a one in a million shot: He was bouncing this ball off the door, went high and it bounced off the wall, the ceiling and the top of the door, coming to rest on top of the door. Now we're going to see how long we can keep it up there. Had pizza for lunch on company dime. Took home an entire Oggi's pizza.